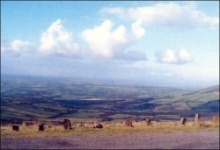 The 2,610 feet summit is crowned with a sepulchral cairn (buried site) dating from the first century of the Christian era and marking the grace of the Cucorb King of Leinster who was slain in battle at the foot of the mountain by Fedhlimidh Reachtmhar, King of Ireland, who was himself slain in 199 A.D. Tradition holds with the theory that when a king or chieftain was killed he should be buried at the highest point of land in the area. 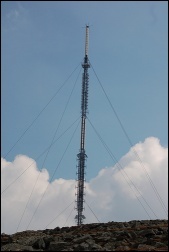 The television mast which now acts as a landmark was erected in 1960. Nearby Sliabh Ban has a smaller cairn and stone chamber and marks another grave from early Christian times. The area was originally evangelised in the 5th century by St. Foirtcheirn, a grandson to Lasire High King of Ireland at the time of St. Patrick. Foirtcheirn had been Bishop of Trim, Co. Meath but left his See to take part in the conversion of the country. 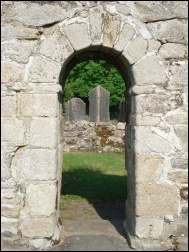 A ruined pre-Norman church, called after St. Finian b. 454, a student of Foirtcheirn, stands almost opposite the Catholic Church of the Holy Cross. Finian known as “The tutor of the Saints of Ireland” was a native of the townsland of Rossacurra near Myshall. 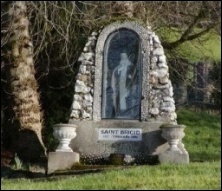 Later an angel led Finian to a spot beside the river Boyne, Clonard, Co. Meath where he founded one of the “greatest schools in Ireland” and where he died about the middle of the sixth century. But Myshall remembers her son with pride and honours him as one of the famous men of Ireland. 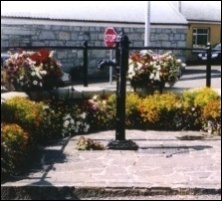 A small amenity park in the village contains a Water Wheel, a bullaun stone and a holy well dedicated to St. Brigid after whom the park is called. There are no known traditions of cures or pilgrimages associated with the well but a patron (pattern) was held annually here on the 14th day of September – the feast of the Holy Cross – titular feast of Myshall. A sheep fair was held on this date up to the 1960’s. It was probably around the village pump that Charles Stewart Parnell made a speech when he came to the village fighting the Carlow By-Election of 1891. 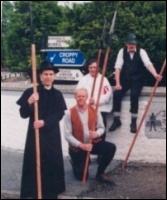 The first mile of the road which leads from the village to Borris is known as the Croppy Road and got its name from the 1798 troubled period of Irish history. Myshall at the time was governed by the local landlord Major Cornwall who was the military officer and magistrate for the district. There were a number of locals in the movement known as the United Irishmen, with Captain James Nolan as their leader, who took part in the battles of Borris returning to Myshall unharmed. 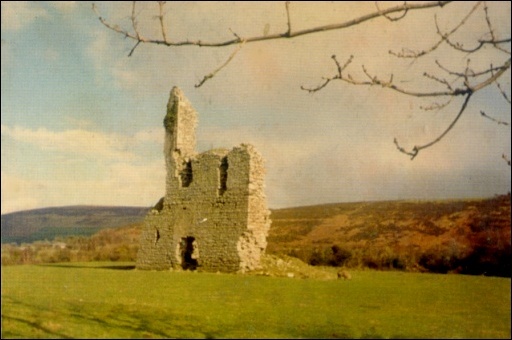 Situated at the foot of one of the slopes of Mount Leinster, Rathnageeragh Castle bears every evidence of having been a place of considerable extent and great strength. The remains consist of a square gatehouse of two storey's. An entrance leads to a central vaulted passageway between two parallel vaulted chambers. A courtyard is visible as a slightly raised platform at the southwest. It was originally built as an out fort by the Kavanagh family until 1631. The castle was destroyed by Cromwell in 1650. 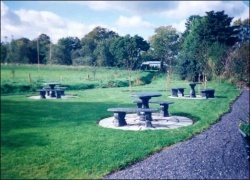 The gun platform used to bombard the building can still be seen on a hill in the neighbouring townsland. Following the Wells Inquisition the Castle and much of its surrounding lands were given to Sir Richard Kennedy. 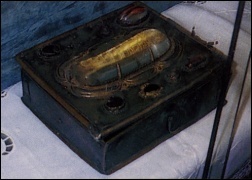 In the last century a set of manacles and fetters were found in the castle walls – they were unique as they were thought to be of Gallic rather than Norman origin. A cannon ball is in the possession of Mr. Michael Slye, Coolasnaughta. 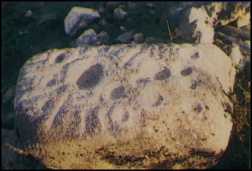 The interior of the ruins consist of a stoned building approx. 20 feet by 8 feet by 2 feet high and are called after celebrated St. Moling who is buried in St. Mullins about 20 miles south of here. The ruined building would seem to suggest a type of oratory and would indicate a hermitage rather than a monastic settlement. St. Moling was a seventh century Saint whose life was well documented. His greatest feat was the remission of the Borumean Tribute which was a tax levied for five hundred years by the High Kings of Ireland on the people of Leinster and had to be paid every second year. Garryhill was the ancient stronghold of the 14th century figure, Art Óg Kavanagh, King of Leinster, who described by the Four Masters as “a man who defended his throne against the English and the Irish from the age of sixteen years to his sixtieth year”. According to local tradition the castle was situated adjacent to what is now Garryhill House which, owned by Lord Bessborough in the 18th century, served as the residence of the Earl’s eldest son Viscount Duncannon.